Welcome to generating Excel workbooks from a template tutorial. This tutorial aims to give you an overview of advanced features of the Excel File Export Block such as how to generate Excel workbooks from a template. Step 1. Place the Excel Workbook Export Block on the Canvas and connect it to input data, then press on the “New Workbook” button in settings. Step 2. Select the “Start with a template” option and click the “Select file” button. Then navigate to your template and click the “Open” button. Step 3. 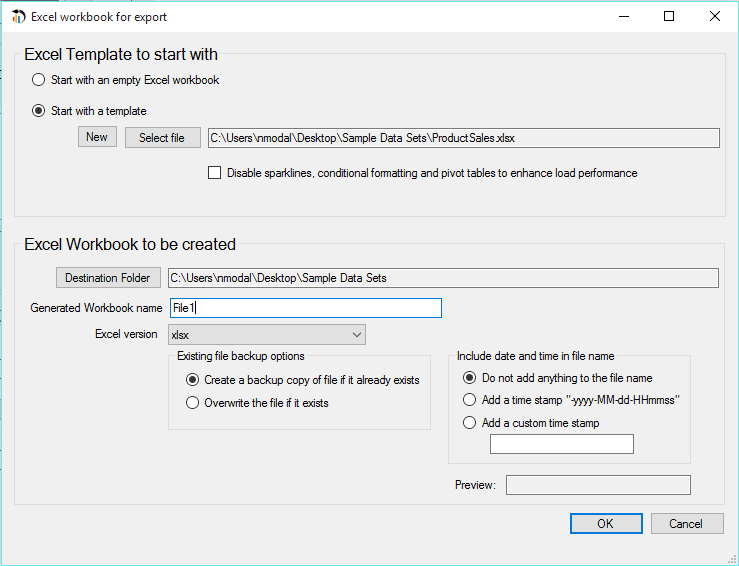 Under “Excel Workbook to be created”, provide the destination folder and name of the file that will be generated from the template. Remember: it should be different from the template’s file name to prevent overwriting. Step 4. Click “OK” to confirm. Step 5. Press the “Pick” button and select where you would like to place the data in your template. Step 6. Press the “Run with outputs” button to generate a new Excel file from the template. Analytics Canvas will generate the Excel workbook. How to upload Bing data directly into google analytics using the cost upload API?